I am very pleased that two of my Raku-fired torsos have been accepted in juried shows in Baltimore and Brooklyn. The Baltimore Clayworks is having a “35th Anniversary Exhibition” to celebrate its decades of providing first-quality support, instruction and show space to ceramic artists. Co-founder Deborah Bedwell is the juror for this show, and I am very glad that she chose a piece of mine, Well Met, to be part of the experience. It is bold and engaging and I think a good fit for this show. The exhibition opens on Friday, September 4th from 6 to 8 pm and runs through October 10th. The Clayworks is located at 5707 Smith Ave. in Baltimore. 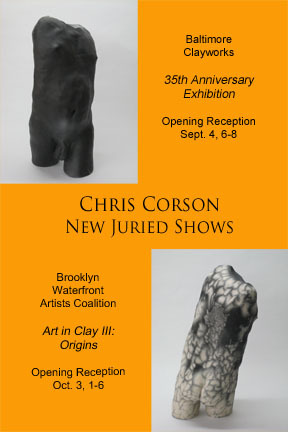 The Brooklyn Waterfront Artists Coalition (BWAC) is continuing a very successful series of ceramic sculpture exhibitions. This year it is “Art in Clay III: Origins,” juried by Judith Schwartz, Professor of Art and Art Education at NYU Steinhardt. She chose a “naked Raku” piece with a very lively surface that for me embodies all peoples in one. I call it Child of God. This show opens on Saturday, October 3rd from 1 to 6 pm and runs through October 25th. BWAC has beautiful gallery space in a pre-Civil War warehouse in the Red Hook section of the Brooklyn waterfront, at 499 Van Brunt St. There is even a free water taxi from Wall Street’s Pier 11 to the Red Hook IKEA adjacent to the BWAC gallery.